Kidtropolis hit ExCeL London this October Half Term; billed as “the perfect fun-filled experience for families with children aged 12 and under” was it really…? As you know, my little boy is just 18 months (seriously, where has that time gone??) so I decided that this event wouldn’t have been suitable for him – he would have just wanted to run around and play with toys that are clearly too old for him. So, it made perfect sense for me to send my roving reporters Kerry and Lucy (along with some friends). What better than to get an 8 year olds perspective? Ok, lets get the negative stuff out of the way. The queues. The most popular attractions had huge queues, so you had to make a decision as to whether you wanted to queue up for something and take a chance that you would be there a long time, or just head to something with a shorter queue. Kerry and Lucy decided to try and cram as much in as possible (and there was so much going on!) that things like the My Little Pony bus were missed. Meeting YouTuber Amazing Arabella was one of the highlights for Lucy – YouTubers are modern day celebs for kids (and some grown-ups of course!). She signed autographs too, which made the girls day. 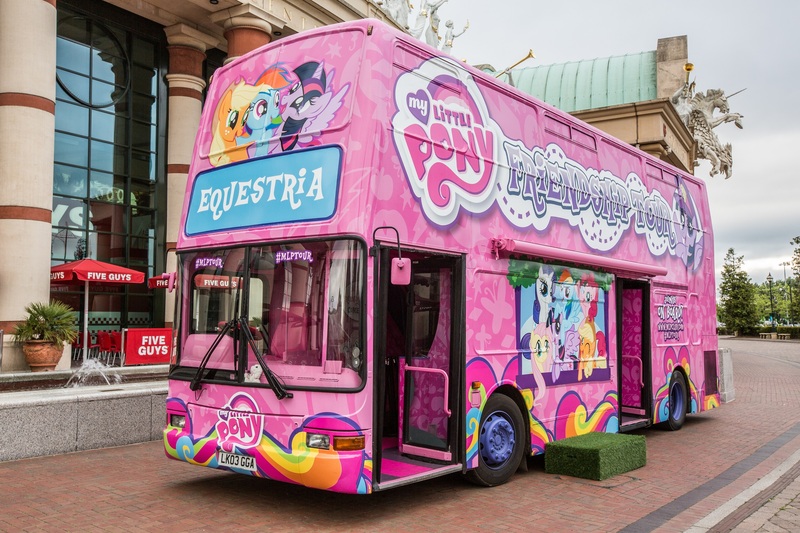 And – although they didn’t actually get to go on the My Little Pony bus – the girls got their face painted (for free) by the people running it, and a free magazine, so that was a sweet touch. Giant Jenga was lots of fun and the girls got on the leaderboard. The people at Bigjigs had a stall there, and were giving out goodie bags to the first few people in… it always pays to be the first through the doors at places like this. Another highlight was the Fun Kids Radio bus; kids had a chance to learn to be a radio DJ with your message and question being put out on the station. Lucy was called a natural at speaking into the mic and really enjoyed that experience, and her it was a huge confidence booster for her friend (and happy Mummy). They spent time enjoying the Playdough tables, with picture cards to encourage them to make things. Lucy made a great penguin & polar bear, and there was a display shelf to display their work. The girls have loved the interactive experience and lots for them to get their hands on and try and have fun with. Lucy liked watching the performers on stage which was a good chance for the Mum’s to grab a seat and a cuppa! Google experience was there and the girls loved that they could see into the sea,into a cage it’s visual learning and they go into schools for free to teach the teachers and make your lesson fun etc. There were lots of interesting stalls dotted about selling products and showcasing their latest toys. One that stood out to Kerry was Magformers; a magnetic construction set for brain development. So, in conclusion, the kids had a great time and have a chance to learn and try new exciting things. You do expect to wait for things but Kerry thought that the fact that some it wasn’t moving as quickly as it could of was a pain. She compared it to when you go to a fun fair and you pay £3 for 5 goes on a bouncy slide etc everyone knows where they stand. More of that needed to be in place. With the remote control toys, kids were waiting a long time for other kids to stop playing; a better system was needed either the remotes need to be set up so they buzz after 2 mins each go or the attendants need to have a timer. There was so much going on, you really needed all day to do everything, including watching the shows; there wasn’t really time to watch the performances as time would have been taken up queuing for activities. There was a roller disco, but the queue was at least an hour.